Montpellier and Paris Saint-Germain have the honour of kicking off the French Ligue Un season as the last two champions get the 380-match program under way but the millions of television viewers may see a dull game. That recently appointed Paris Saint-Germain boss Laurent Blanc is a Montpellier legend – he is the team’s leading goal scorer even though he spent half of his time there playing in defence – adds spice to the contest. However, there are good grounds for expecting the game to feature fewer than three goals and betting accordingly. If you want an exciting market then check out my post earlier today on the French Ligue 1 top goal scorer betting. For this weekend however, don’t expect goals! First, new Montpellier manager Jean Fernandez has said that his side is not afraid of Paris Saint-Germain but then gone on to say that PSG has the French Ligue Un title in the bag already. Talk about mixed messages. Montpellier did not cover itself in glory last term – it finished in ninth position and did not play like a champion should – so Fernandez, who quit Nancy for a fresh challenge, will not want PSG’s stars to embarrass him on his opening night. Second, Montpellier’s pre-season matches have been light on for goals. Three of Montpellier’s six warm-up games ended in 0-0 draws, with the other three resulting in a 1-0 away win over Ajaccio, a 2-0 away win over Arles and a 3-0 away win over a regional team. Montpellier looks like it will be a solid French Ligue Un side this season, if unspectacular. Third, Paris Saint-Germain is very unlikely to field its strongest side. Record PSG signing Edinson Cavani only started training with his teammates earlier this week – previously he had been undergoing a specific one-on-one program – so the odds are that he will not feature in the majority of the match, if at all. PSG remains a powerful side without Cavani – after all, it won last term’s French Ligue Un title by 12 points without him – but bookmakers have framed their markets expecting the Uruguayan to play. And finally, one can expect both Montpellier and Paris Saint-Germain to be rusty and nervous as each of them embarks on a new journey under a new leader. Cohesion, particularly for PSG, will come in time. But maybe not as early as the first game of the first championship round. 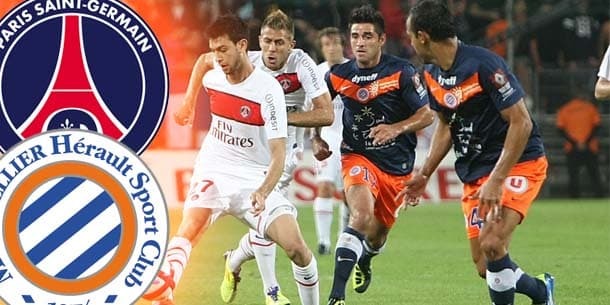 Paris Saint-Germain is trading at odds of 1.85 with Coral to collect maximum points from its French Ligue Un opener. PSG does not appeal at odds on away from home given that its away record last season was 12 wins, four draws and three losses, while Montpellier’s home record was 11 wins, five draws and three losses. Of the three match betting options, the one that makes the most punting appeal is the draw, which one can back at odds of around 3.50. But such is PSG’s potential class edge over every top-flight team except Monaco that the match betting market is best swerved. Bookmakers are offering odds of around 1.74 at Stan James that Montpellier and Paris Saint-Germain combine for fewer than three goals and, in the circumstances, betting on under 2.5 goals is the pick of the available plays. Although PSG was dominant last term, half of its 38 French League Un games did not feature more than two goals. Indeed, only matches featuring Ajaccio, Bordeaux, Olympique Marseilles and Reims had lower averages. A bet on under 2.5 goals would have collected both times that Montpellier and Paris Saint-Germain clashed in French Ligue Un last season. The sides drew 1-1 in Montpellier in spite of the home team enjoying a one-man advantage for 55 minutes, while only an 80th-minute PSG goal separated the sides in the capital. So recent history supports the punt. The pick of the other French Ligue Un fixtures see Monaco travel to Bordeaux, Olympique Lyonnais entertain Nice and Olympique Marseilles visit promoted Guincamp. Lille is the hottest favourite on the coupon, with Ladbrokes quoting it at 1.70 to beat Lorient at home. Lille has been talked up in some quarters as the biggest threat to Paris Saint-Germain and Monaco, with former Montpellier chief Rene Girard in the hot seat and the talented squad at his disposal not having to worry about European football.